Identification: Often mistaken for the larger beaver (Castor canadensis) or the smaller muskrat (Odantara zibethicus), this semi-aquatic rodent has brown fur with a white muzzle and chin. Its large, orange incisors often emerge from beneath the lips. Unlike the flattened tail of the beaver and muskrat, nutria have a long rounded tail, which is scaled with some hair. Front feet are not webbed; only the four of the five toes of the hind feet are webbed. Current Distribution: Coastal areas in the five U.S. Gulf states, particularly Louisiana. Current population size is unknown but at the height of the trapping industry, in the mid-1970s, an average of 1.5 million individuals was captured per year..
Site and Date of Introduction: Nutria are generally thought to have been first released into the marshes surrounding New Orleans in the 1930s although the U.S. Geological Survey claims that an earlier population was brought to California in 1899. Introduced into the U.S. as an alternative to mink fur, trappers supposedly recaptured the initial Louisiana population. Tabasco tycoon L.A. McIlhenny kept a nutria ranch on Avery Island, LA where between 12 and 20 individuals escaped in 1938. 150 additional nutria escaped from this island during a hurricane in 1940. In addition to escapees from fur farms, populations have been introduced in the Gulf states to control vegetation in lakes and ponds. Mode(s) of Introduction: Imported from South America for the fur industry. Reason(s) Why it has Become Established: Nutria are very successful procreators. Sexual maturity may be reached as early as four months of age with an average age of maturity occurring at eight months. Mating season lasts all year. Females gestate for slightly more than four months and anywhere between 1 and 11 pups may be born (with an average of 4-6). Females may enter estrous as soon as 24 hours after giving birth. Nutria have also adapted well to their new environment because they will eat almost any available terrestrial or aquatic green plant. The marshes, swamps and crop fields of their new habitat provide them with an abundant food source. Described as “eating machines”, newborn nutria begin feeding on plants within 24 hours of birth. Ecological Role: In their native habitat of South American marshes and coastal lakes, nutria are well adapted to regular periods of drought and flood. Their ability to breed quickly allows their populations to stabilize well after frequent crashes caused by the drought-flood cycles. However, without these regular cycles to regulate population size, nutria numbers quickly grow out of control. Crops preyed upon by nutria include rice, sugar cane, and soybeans. Preferred wild species include: three-cornered grass, cattail, bullwhip, alligator weed and duckweed. Alligators prey upon adult nutria; turtles, gar, snakes, birds of prey and other swamp animals may eat juvenile nutria. Benefit(s): There are no direct benefits from the nutria population in its non-native habitat. As mentioned above, some nutria populations were established for the purpose of controlling invasive aquatic plant populations in lakes in the Gulf region. However, their appetite for local plant species made their presence more damaging than useful. 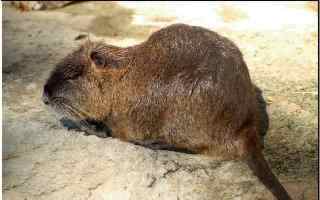 In South America, nutria fur is used commercially. If the fur of the nutria were to ever catch on in the United States, less mink would need to be harvested. Barrier Islands - Where Nutria feed on sea oats, sea dune stability may be threatened. Wildlife – Recent declines in muskrat populations have been attributed to competition with nutria for food resources. Crops – Extensive damage has been reported in rice, soybean, and sugar fields both from direct predation and from damage caused by nutria burrowing. Parasites and diseases – Louisiana nutria have been found to carry several diseases, viruses, and parasites. Most notably, they carry the nematode Strongyloides myopotami, which can cause a severe itching rash in people handling nutria. Control Level Diagnosis: “Highest Priority” - Sensitive wetland ecosystems around the Gulf of Mexico require the highest level of protection. Besides posing a threat to the numerous plant, animal and insect species that populate wetlands, degradation of these fragile areas impacts the surrounding Gulf of Mexico ecosystem. For example, when nutria remove stabilizing grasses from marsh areas, soil is washed into the Gulf by tides and by storms. This siltation of Gulf waters then threatens Gulf creatures and habitats. Damage to crops and the resulting impact on the economy of the southeast also should be taken into consideration. Control Method: Considerable effort has been spent to encourage the trapping of nutria for fur and, more recently, meat. While fur harvesting was the original idea behind the importation of nutria, the demand for fur is currently low. Fur trapping peaked in the 1970s when prices were high and the pelts were sold largely in Germany. During this period, damage to wetlands and crops markedly decreased. Then in the early 1980s, the demand for nutria fur plummeted. Prices fell and trappers sought income elsewhere. Since then the population has exploded. The Louisiana Department of Wildlife and Fisheries estimates that one million nutria would need to be captured each year to mitigate the damage they cause. In 1986, the Louisiana Fur and Alligator Advisory Council was created in part to develop the market for nutria fur and meat. Current annual harvests average around 350,000, well short of required harvest levels. To better control the destructive nutria population, trapping for non-commercial purposes may need to be considered. State or federal authorities should investigate the possibility of capture and destruction of nutria individuals in a program similar to the capture of feral pigs on the island of Hawai'i.